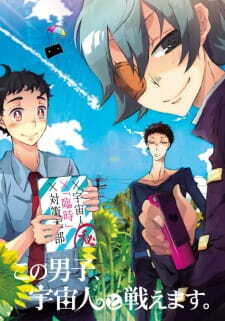 Other: Kono Danshi, Ningyo Hiroimashita., Kono Danshi, Sekika ni Nayandemasu., Kono Danshi, Mahou ga Oshigoto Desu. Some people say that there's no plot and the story is too simple but I can't disagree more. The show makes you ponder about the deeper question behind it. Why are they attacking? Why should I fight? What happens if I don't? Am I alone? To me, the story is absolutely stunning (and I ended up crying a little while watching). It is some what light hearted but those who have watched anime like Bokurano will definitely be struck by the similarity between the underlying theme. The main issue with this is the animation. However, I came to watch it with the full knowledge that it is a mixture of anime and comics animation so while it is a major drawback, I was not too much of an issue to me. This anime's story line is a bit airy. U never find out his direct connection to the aliens and why he of all people was chosen to fight but, the story has a broader focus. Dealing with the issues of abandonment and the overwhelming feeling of loneliness in a world that isn't always kind. It's touching and leaves u teary eyed. The art is also quite different then your typical anime and the setting and characters are drawn in an unusual, but fresh way. The art it's self compensates for areas where there is minimal animation. This OVA would have made an even greater series if it was further developed. This was perhaps the one of the most touching things I've watched this new year. If you are a person that likes everything explained and wrapped up nicely in a neat little box, you're not going to like this. However, if you're the type that can enjoy an endearing and heartwarming story, then I promise you won't hate it. A bit about the plot first - aliens invade the world and attack once a day. Only one boy has the power to fight the aliens but he's lost his memories. Anything regarding the aliens or why only Kakashi can fight them goes unanswered - and I suppose that's mostly because the aliens are the not main point of this story. I interpreted the aliens to be a metaphor for Kakashi struggling against himself. I can't tell you why without giving away the end. This story asks a question: is the world a kind place? Kakashi is happy with his new life but he is forced to wonder, does he have friends? Are there people who truly care about him? Why does he have to fight everyday? What happens if he chooses not to fight? It's a very touching although short story. The anime is a mix of animation/comic style artwork. Personally, I found it to be rather refreshing with beautiful artwork. It was definitely stylistic and eye-catching, though there were some odd angles but to me it just made the art even more interesting. And the music... ok, there was a scene where Erik Satie's Gymnopedie started playing and it was like... just perfect. The scene mixed with the music created this heartwarming feeling. This particular anime is not for everyone. I will say that. But if you're open to something completely different from the norm, and want to see a story that's both happy and sad, then this is the one for you. And I can honestly say, that I started this anime with a frown on my face but by the end, I had a smile. Only one episode. The animation is a little broken. But instead of it being broken artistically it just looks a little sloppy. Also the voice acting is just not as good as it could be. Overall it is just mediocre. But after all that slander i personally enjoyed it. Rough round the edges but it left a lot of room for imagination. I am always a fan of suspension of disbelief.